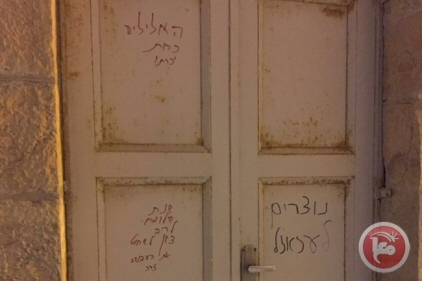 Two Israeli teenagers suspected of scrawling hate speech on a historic church in occupied East Jerusalem, earlier this week, have been arrested, according to Israeli police.A spokesperson said that a 16-year-old Jewish suspect was arrested on Tuesday and another Jewish teen, aged 15, was arrested on Wednesday, following ongoing police investigations. The two are suspected of writing “Nazi and anti-Christian slogans” on the walls of the Dormition Abbey, al-Samri said. Dormition Abbey — dating back to the 5th century and thought to be the place where the Virgin Mary died — has been site to hate crimes in the past. Jewish extremist Yinon Reuveni was charged earlier this month, along with several minors, for torching the church in a previous attack. The extremist was charged during the same investigation that charged two Israeli suspects for an arson attack that killed three members of the Palestinian Dawabsha family in the occupied West Bank, last summer. The investigation gained international attention following the deadly attack, which raised criticism against the Israeli government for granting impunity to Israelis who carry out attacks on Palestinians and their property. The UN reported in September that complaints lodged against such attacks have a 91 percent chance of being dismissed without effective action, whereas around 95 percent of complaints filed by Israelis against Palestinians proceed to court.